The former housemate, who fell pregnant with ex-boyfriend Nick Henderson's baby, welcomed Hunter Alexander James into the world on August 20, and we have the first snaps of the new mum with her pride and joy. And unsurprisingly, Harry told us that the birth was dramatic enough for a soap storyline. 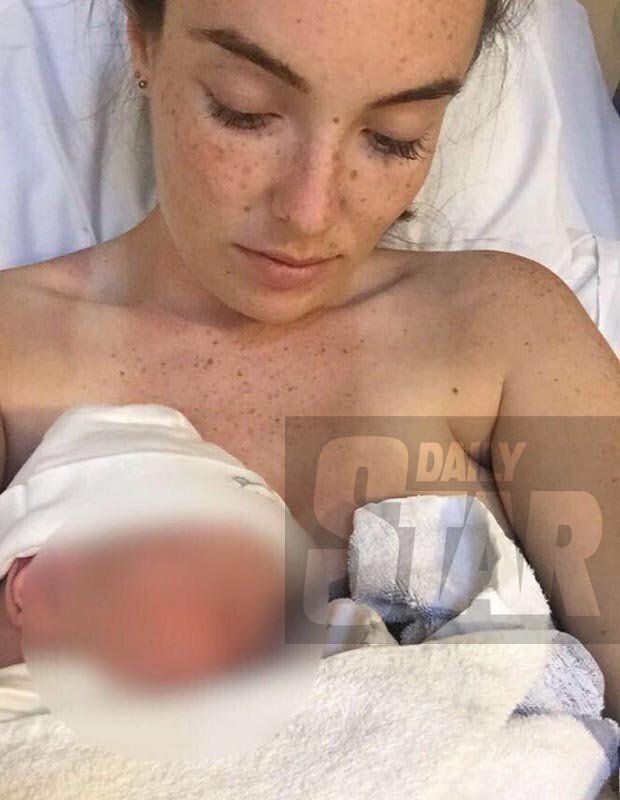 Speaking to the Daily Star Online, the 23-year-old revealed: "Not only did he arrive on my due date, I arrived at the hospital at 8am, he was out by 8.29!" The super-quick delivery came after Harry simply thought she was suffering from a tummy ache and didn't want to cause a fuss. She said: "With your first baby, they tell you you'll have a lot of false starts. But I'm a glutton for punishment, I never like to admit that I'm hurting. Both my sisters were in work, and I thought I had indigestion or a tummy bug. I took a couple of paracetamol, because I wasn't going to call my sisters for a false alarm. I finally admitted defeat at 7am, and I called my sister. When they came in, I was literally shouting, 'I need to push'. "In true Harry style, I almost ran out of the house naked because I couldn't get my dress on, I was running to the car getting dressed. Looking back it was quite comical, but at the time it wasn't funny." Harry was having contractions in the car park and the hospital corridors, and her waters broke when she was rushed into a room. She told us: "I was still convinced I was being a wuss. Then I scrambled onto the bed and my waters just went everywhere. I just started asking for the anaesthetist and an epidural. "But my midwife Sarah examined me and said, 'Well, you can't have an epidural because he's almost here. He's got a lot of hair you know.' And I was like, 'Oh s***'. "My birth plan was just to wing it, and I was absolutely fine. But a couple of weeks before I gave birth, another mum told me about episiotomies. I Googled what it was. My midwife had to deal with me saying over and over again, 'If you have to cut my *******y open, just don't tell me, I don't want to know'. She kept laughing, saying 'We don't have to cut your *******y open'. I was quite lucky, though, my midwife was amazing." When Hunter arrived, Harry was shocked at how big he was – the baby boy was 8 pounds 6 oz, despite nurses telling her that he would only be roughly 7 pounds. "He's too big for newborn clothes," Harry laughed. The fetish model, who appeared on Big Brother in summer 2015, gushed that Hunter is "absolutely beautiful", but there's a reason that we won't be seeing his face splashed on social media. She explained: "As much as I want to show him off to the world, I'm not going to show his face. I was trolled so much during my pregnancy, people said such horrible things, and I don't want that for child. I speak to Luisa Zissman a bit, and I've seen all the horrible things people have been writing about [her new daughter] Indigo on her Instagram, it's atrocious. "I've blurred Hunter's face in all the photos, not to hide him, but because that scares me. I don't want my child growing up and reading those things, as well as stuff that's been said about his mum. But he looks a lot like me, he has a lot of dark hair, he's really long, he definitely got my legs." Harry is adjusting well to life as a mum, and told us that Hunter is a good baby, although "for some reason he only burps when you hold him up like Rafiki from The Lion King". However, just because she's a mother now, don't expect her to suddenly change personality. Harry said: "Everyone expects me to change, and swear less, and turn into this maternal earth mother who only believes in organic fruit and vegetables. I'd go to the ends of the earth for my family, but there's such pressure on mums to act a certain way in society, you're constantly judged as a parent. I put my family before myself, and my son is always going to come before me. But I'm not gonna start talking about baby poo and wearing vegan shoes. "I've already booked in for my post-baby Botox, and I might treat myself to a non-surgical rhinoplasty. I won't be sitting around on Mumsnet all day." Mother of the year sorted. 29 min labour BB17 length teas? 'If you have to cut my *******y open, just don't tell me, I don't want to know'. They broke up, she got pregnant, he wasn't around for the child's birth, barely pays attention to the child (not sure if he's seen him at all), she has a new boyfriend, Nick Henderson is trash, etc.